Predicting the price of oil is pointless, and investing based on the price of oil is just plain crazy. A couple days ago, I read a fascinating piece by an analyst who predicted that the price of oil would plummet. He covered every possible angle that supports this idea: increasing short positions, fiscal policy changes, increasing production in the U.S. and in other parts of the world, and slowing demand in Organization for Economic Cooperation and Development nations, to name just a few. The article went into extreme detail on each of these points and explained why they were a signal that oil was headed nowhere but down. Then, in the very same week, a group of militants called the Islamic State of Iraq and Syria captured the city of Mosul, Iraq, thus threatening the nation's oil production. 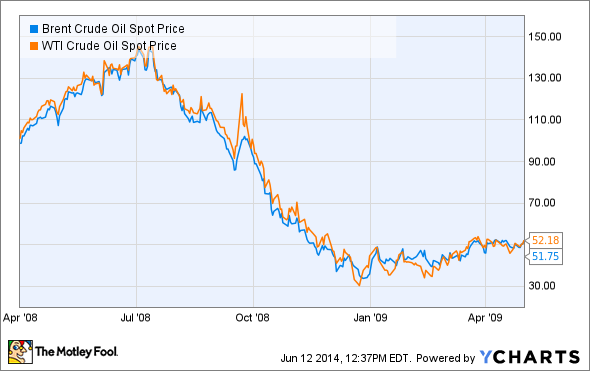 I'll give you one guess where oil prices have gone since then. I'll confess to having succumbed to the stupid notion that I knew where oil prices were headed. Of course, I have been wrong so far. My folly as an oil price prognosticator, and other analysts being just as wrong, has taught me a very valuable lesson: No matter how smart and thorough an analysis may be, any prediction about the price of oil is a blind guess and anyone who is right just got lucky. Here is the problem with trying to actually predict oil prices, as described by former defense secretary Donald Rumsfeld. It sounds silly when said out loud, but there is a profound truth to it. The global oil market is quite possibly the world's most complex supply chain and it can be thrown wildly off course by any of hundreds of unforeseeable variables on any given day. Call them what you want: unknown unknowns, black swan events, it doesn't matter. These variables happen all the time, and even the most informed people in the world -- OPEC's ministers -- get tripped up by them. Let's wind the clock back to 1996: World oil demand had just increased by 2 million barrels in just a day, and OPEC estimated that it would climb another 2 million over the next year on the strength of global economic growth, especially the Asia-Pacific region. So OPEC determined that every member could produce at almost maximum capacity and prices would remain at a comfortable $25 per barrel. Within months, the collapse of an overdeveloped real estate market in Bangkok set off a financial chain reaction that saw the gross domestic product of Thailand, Indonesia, the Philippines, Malaysia, and South Korea slump between 35% and 80% and a general economic malaise spread across the entire world. This led to oil prices dropping by 50% within a year, which sent several OPEC nations to the brink of bankruptcy. For over a decade afterward, OPEC's ministers were extremely conservative about production and prices, until they decided that the world could easily support $70-$80 per-barrel oil and set for flat-out production again in early 2008, right before Lehman Brothers went belly up. We all know what happened after that. No matter how much information you gather, any prediction on the price of oil will likely get disrupted by an unforeseen event. Knowing this, you would think that investing solely on your ability to see future oil prices should be avoided at all costs. For some reason, however, there are actual methods to invest just like that. These are formally known as oil and gas exchange-traded funds, but a more accurate name would be investments for the clinically insane. 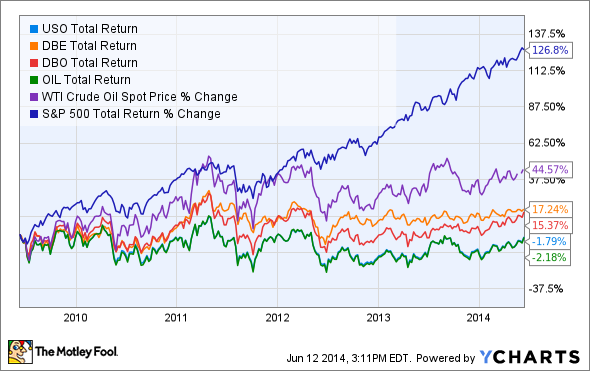 These ETFs exist to trade futures contracts on oil and gas. Never at any given point do they own a single barrel of oil, just a piece of paper that says "I agree with what this person thinks about future oil prices." It should be so surprise, then, that the four largest oil and gas ETFs -- United States Oil (NYSEMKT:USO), PowerShares DB Energy (NYSEMKT:DBE), PowerShares DB Oil (NYSEMKT:DBO), and iPath S&P GSCI Crude Oil TR Index ETN (NYSEMKT:OIL)-- have done a horrible job of both predicting the price of oil and being solid long-term investments. USO Total Return Price data by YCharts. Nonetheless, oil and gas ETFs hold over $2 billion in assets, and on average will trade hands almost 10 million times per day. All based on the idea that someone thinks he or she is smart enough to predict the price of oil, and so far they have been unable to do it. Unless you have traveled back in time to today, you have no idea where the price of oil will go. It's OK, neither do I and neither does anyone else on the planet. There are too many Bangkok real estate bubbles, Lehman Brothers collapses, and rebel insurgencies out there waiting to kill your theory faster than a Game of Thrones character. 1) We will never again think we can predict the price of oil. 2) We will, under no circumstances, invest based on what we think the future of oil prices will be. 3) Whenever we hear anyone else make a prediction, we will simply reply: You forgot to include the unknown unknowns.